FILE- Comoros Gendarmerie officers carry an injured policeman wearing civilian clothes as they disperse opposition supporters, in Moroni, on March 25, 2019. Four people died Thursday in a gunfight at a military camp in Comoros where the police had detained an opposition presidential candidate following Sunday’s disputed presidential election. VOA's Swahili service reported that at least seven people were injured. 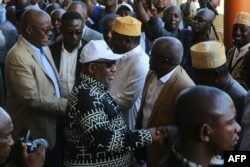 FILE - Incumbent Comoros President Azali Assoumani (front) greets supporters in Moroni on March 27, 2019 during celebrations for his re-election. The change alters a balance of power established in 2001 that sought to end separatist crises. Under the old constitution, the presidency rotated among the presidents of the country's three main islands — Anjouan, Moheli and Grande Comore, which also is known as N'gazidja. Abdushakur Aboud of VOA's Swahili service contributed to this report.